Earlier this week, Airwallex became the latest payments company to achieve unicorn status. It followed a winning formula that has enabled it to achieve triple digit growth: it operates in a hot sector (B2B cross-border payments), focuses on China and ecommerce and is very tech forward. China is hot; last month, Chinese financial services firm, Ant Financial, closed its acquisition of WorldFirst for c.$700m. 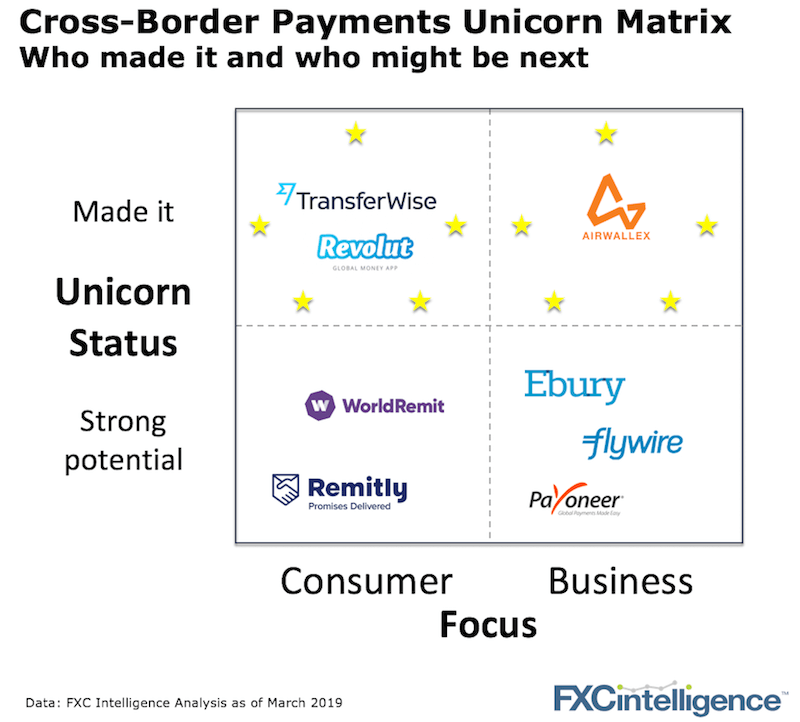 The next Unicorns in cross-border payments? Two consumer orientated companies, WorldRemit and Remitly are currently large enough to be contenders. Flywire’s receivables product is winning big payment clients from incumbents such as Western Union Business Solutions. Payoneer is riding the ecommerce wave and focusing on China like Airwallex and WorldFirst. Ebury has c.20,000 customers and is one of the fastest growing SME-focused payment companies. BUT…only one metric is going to make the difference. Growth. Not linear growth, but growth in the 50-100% range, year on year. That’s the growth TransferWise, Revolut and Airwallex have achieved which has made them unicorns.